This was the other super hero comic that I got in the 3-Bag with JUSTICE LEAGUE OF AMERICA #120. 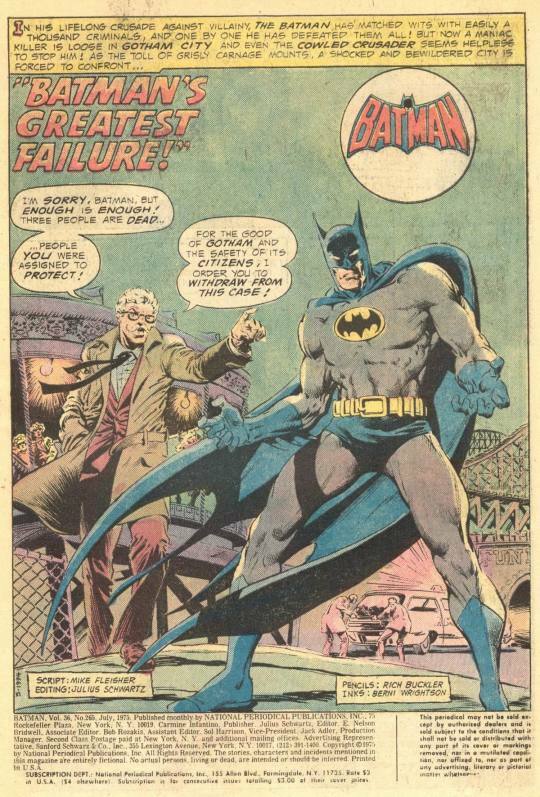 I don’t have all that much to say about this issue of BATMAN, as while it’s a competently done issue, nothing about it especially stuck with me–with one very specific exception that we’ll get to later. 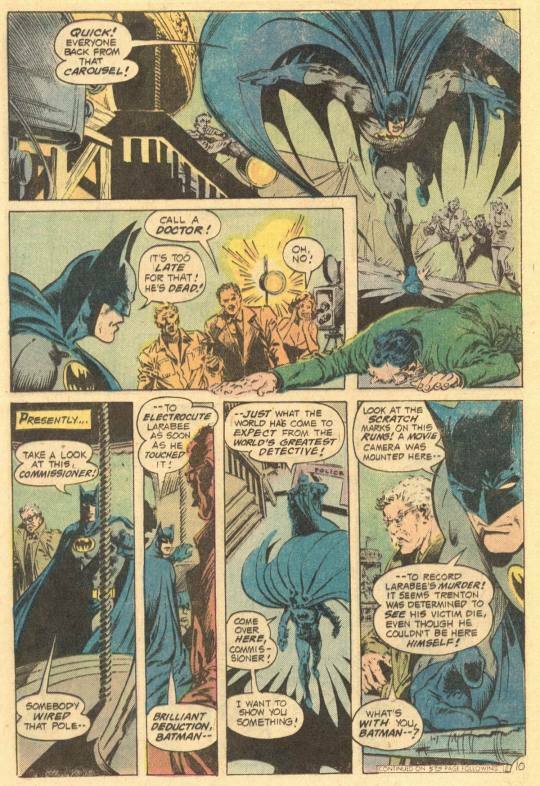 It’s the kind of more realistic Batman story that was somewhat in vogue during this period–no colorful villains, no larger-than-life situations. The equivalent of a TV cop show, but with Batman in the middle of it. 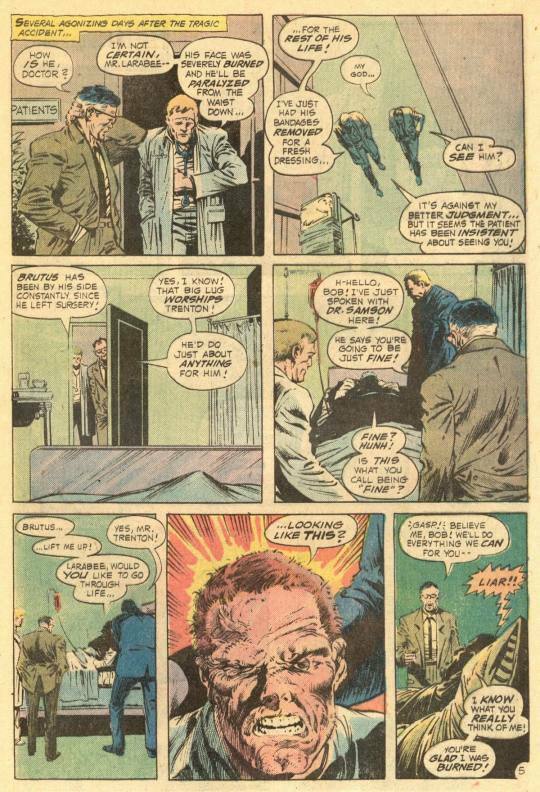 One of the benefits of this approach was that it made batman more fallible, less an absolutely unstoppable juggernaut, as he’s typically treated today. On the downside, these stories could be kind of, well, dull. And here’s that shot that disturbed me, of actor Robert Trenton after he was caught in a stunt-gone-wrong on the set of his latest film and horribly disfigured. The story involves Trenton’s attempts to get revenge for his disfigurement on those he feels are responsible, aided by his man-mountain of a bodyguard, Brutus. Despite Batman’s presence, Trenton is able to make good on his first threat, electrocuting his former stunt coordinator Larabee by hot-wiring a carousel in the next picture he is working on. Additionally, Trenton is filming his murders for his own amusement, which will make for some fine evidence assuming that Batman catches up with him. He hasn’t been doing too well in this story so far, with one guy killed in front of him, and another scarred in part because he wasn’t fast enough with his rescue. Not satisfied with one victim, Trenton sends a letter saying that he intends to kill the entire cast of his final picture, in the order of their appearance. At which point, the smart thing to do would be to shut down production–but not in Gotham City, which desperately wants the tax revenue to be gained by having productions film within the city. 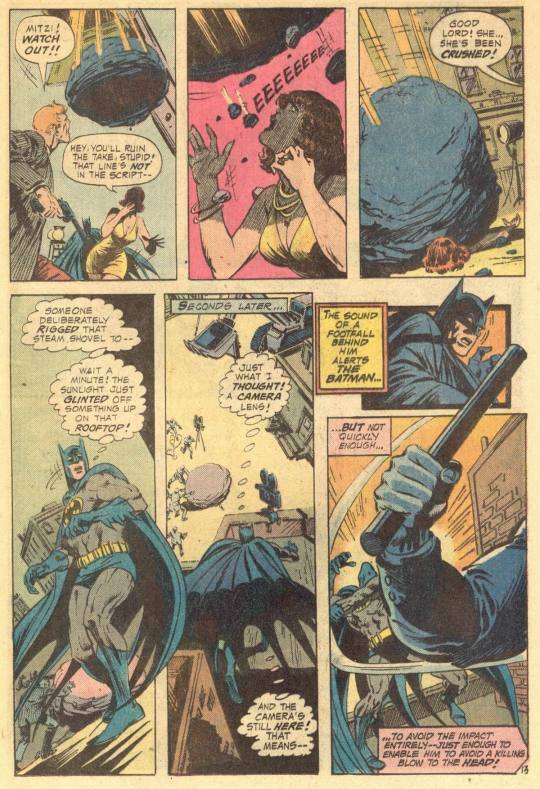 And so, Mitzi gets a boulder dropped on her, crushing her to death, while the Batman just hangs around looking foolish. Even Commissioner Gordon has had enough at this point, threatening to take Batman off the case if he fouls up just one more time. Good luck getting that to stick, Commissioner! 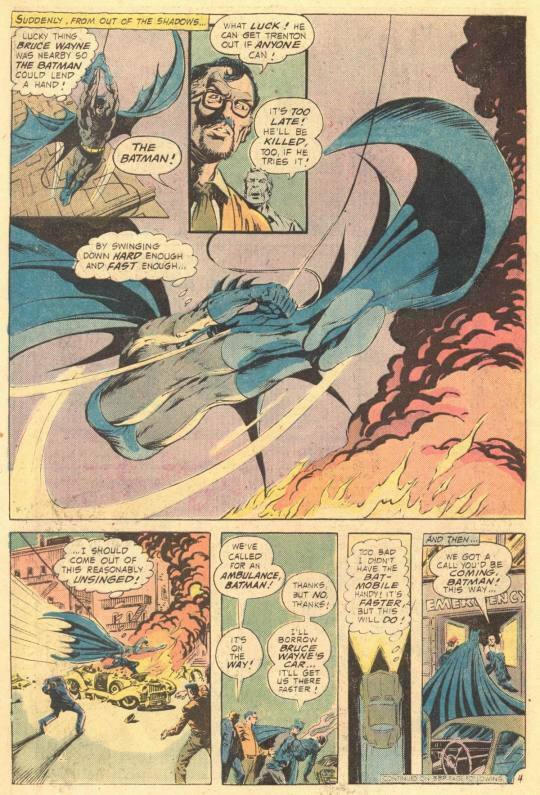 In any event, the next day, poor old Doug has an explosion go off in his face, and once again the Batman is an unimpressed observer. But he does marshal up enough enthusiasm to go after Brutus at this point. 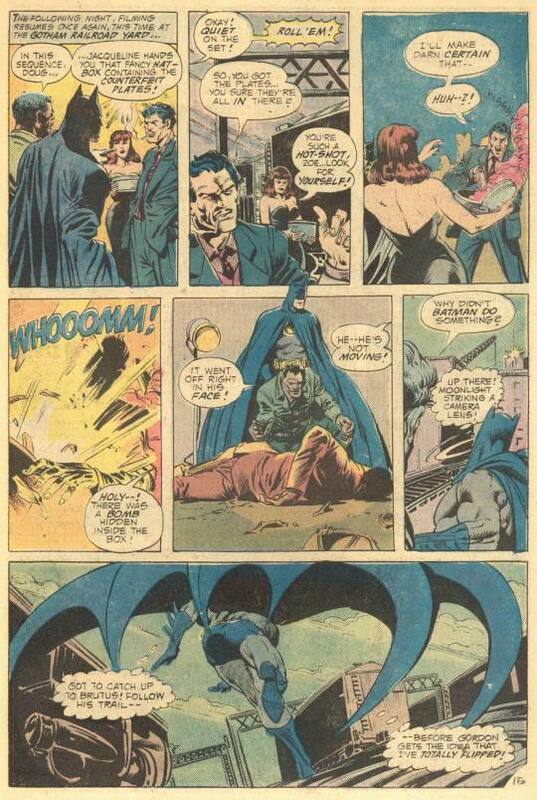 Bursting in on Brutus and Trenton, Batman has a furious battle with the man-brute. But he’s a bit overmatched. 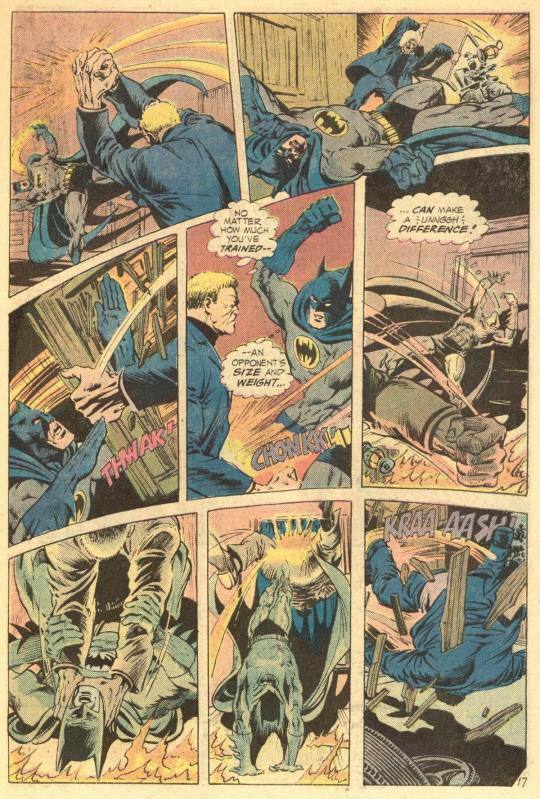 Speaking of matches, a fire is started during the scuffle–and while Batman does eventually put down Brutus, Trenton himself is trapped within the blaze and dies horribly. On the better side, Batman was one step ahead the whole time, and had defused the earlier three booby-traps (including, somehow, that boulder dropped on Mitzi), so they’re all actually alive and in hiding–this is why he seemed so unconcerned about them, and so clutzy. Doesn’t do anything to help out poor Trenton, mind you. But that’s the way it goes. 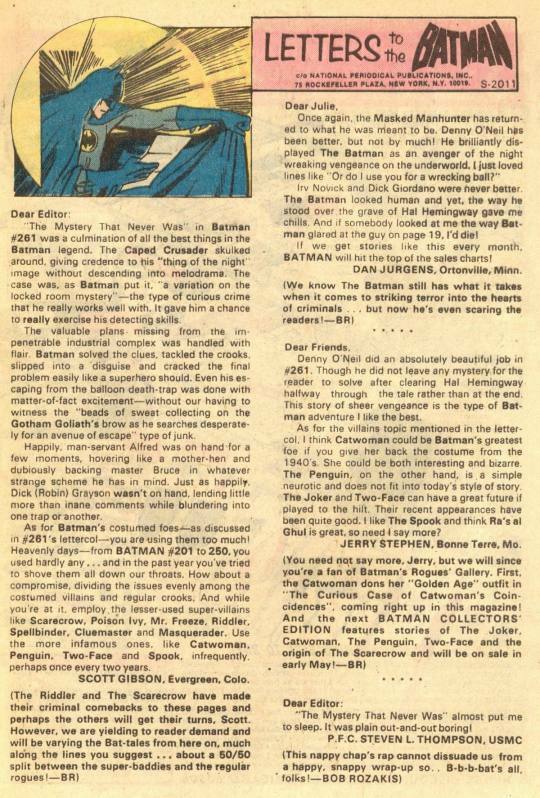 And just like the JUSTICE LEAGUE issue, the letters page here also includes a missive from a young Dan Jurgens. This one’s a bit more substantial than the JLA one.